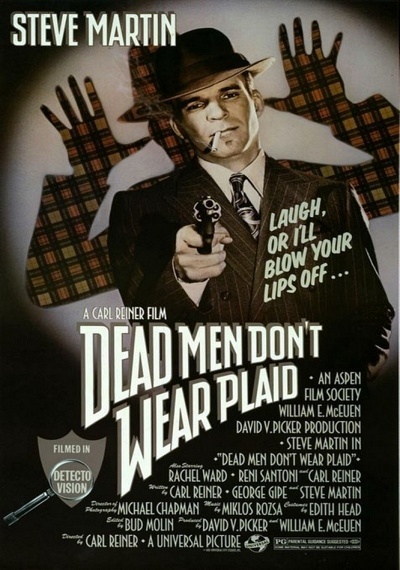 Dead Men Don't Wear Plaid :: Movie Information :: RabbitTV GO! As the private eyes of private eyes, Steve Martin is Rigby Reardon. He's tough, rough and ready to take on anything when Juliet Forrest (Rachel Ward) appears on the scene with a case: her father, a noted scientist, philanthropist and cheesemaker, had died mysteriously. Reardon immediately smells a rat and follows a complex maze of clues that lead him to the "Carlotta Lists." With a little help from his "friends", Alan Ladd, Barbara Stanwyck, Ray Milland, Burt Lancaster, Humphrey Bogart, Charles Laughton, etc., Reardon gets his man. An exciting, action-fun packed film the way '40s films used to be!